Asus has added two new superslim Seashell Eee PCs to its netbook family in the UK, with the new 1005HA and 1101HA models out later this month. Asus' two new Seashell Eee PCs - the 10.1 inch 1005HA and the 11.6 inch 1101HA – are the first in the super-slim range of netbooks with replaceable batteries. "Both models will join the existing 1008HA model, combining an elegant and lightweight design with the latest mobile technology for a perfect combination of style and portability," reads Asus' release. Eee Sharing: allows sharing and syncing of messages and data with other Eee PC users and Desktop PCs, even without an Internet connection. Eee Tools: a collection of useful tools including Parental Control. The Asus Eee PC 1005HA has – or at least Asus claims it has – up to an impressive 10.5 hours lifetime on one battery, a 160GB HDD Storage and the usual Wi-Fi 802.11n, Bluetooth 2.1, 1.3 megapixel webcam, 3 USB ports and runs Windows XP Home. 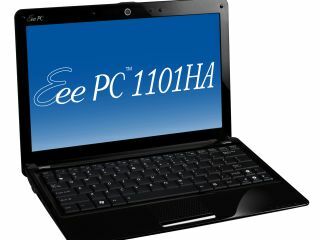 The slightly larger Eee PC 1101HA has an 11.6" LED backlit display, with a maximum resolution of 1366 x 768. If you are away from a power source for days at a time, then these latest Eee PCs could well be the netbooks for you. Pricing is still to be finalised. Want to see more? Check out Asus' YouTube channel.